I don’t know about you, but when I read today’s Gospel (Mark 6:53-56), I’m amazed by the faith of the people in the crowd. As soon as they see Jesus, they bolt into action. There’s no hanging back, wondering what friends might think or waiting on someone else’s cue. They want an encounter with Jesus and drop everything to seek Him. So often, self-regard—that is, the constant concern over how we might be perceived—gets in the way of our ability to encounter Jesus. It attempts to limit how God desires to work in us and through us to reach others. I recently learned more about this rampant root sin of “false humility”—really a sneaky sort of pride creating an almost obsessive focus on self. False humility shows up in so many ways: wondering how we look or sound when interacting, censoring a picture from an authentic moment because we’re too busy recoiling at our ‘double chin.’ Feeling like we have to make excuses because we think we’re not measuring up to someone else’s expectations (or what we imagine them to be). In false humility, we analyze ourselves from the outside—gauging the reactions of people we put on pedestals (though they’re still just as human as us) and trying to calculate the perfectly balanced response. The pressure and anxiety false humility creates is unreal. We lose the ability to be fully present in that moment, and therefore lose the chance to both fully encounter and communicate God’s love. On the flip side, real humility is incredibly life-giving—it’s being so invested in conversation you forget to analyze yourself, or appreciating a picture for the experience. Like the faithful in the Gospel, we’re created to chase that encounter with Jesus in the present moment to heal and validate both ourselves and others—running to Him with abandon. Overcoming false humility takes hard work and self-awareness, but it’s possible—and rewarding. 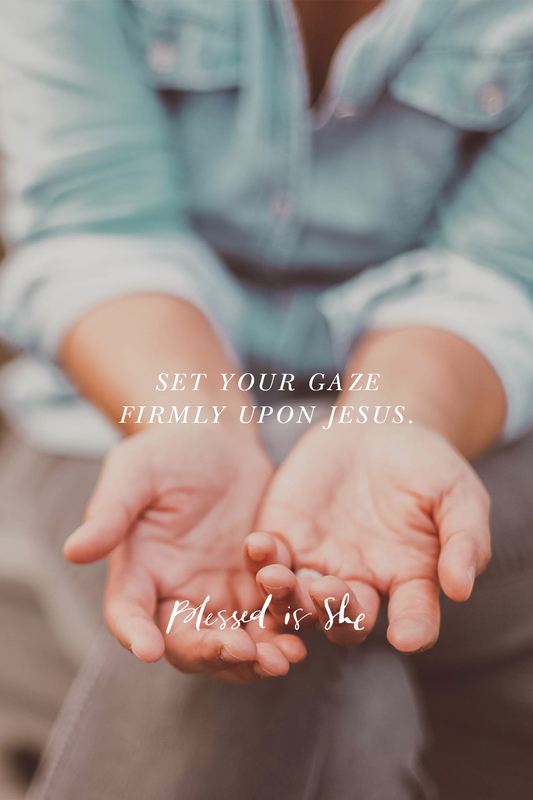 It means constantly taking our eyes off of ourselves, and setting our gaze firmly upon Jesus, and it’s not a one-time deal. It’s a continual battle—but one in which the more we fight to keep our focus, the easier it is to keep our eyes on the One who brings freedom, healing, and life. Pray the Litany of Humility with me today, and spend at least one minute being fully present to someone in front of you. See if it doesn’t turn into more! Next Post How Lovely Is Your Dwelling Place? Fake humility is actually alot of hard work. I pray to keep my focus on Him! Thanks Megan for this timely reflection. God bless…. As usual your words yanked my heartstrings, and I mean in a good way. I could feel my soul stirring. False humility. It has plagued me for as long as I can remember. It paralyzed me. I couldn’t respond to God’s call. It’s only within the past few years that I’ve become self aware and began healing. Thank you for the gentle reminder to seek Him in others, focus on Him over self. His will be done. This is beautiful! thank you so much for writing this! I’ve never thought about false humility this way before…I thought it was more of putting oneself down or an insincere humility. This description you give hits me right between the eyes with something that I battle that I previously had no word for and maybe never fully gave attention to. Like a humming in the background taking away from a full experience of others or with the Lord because of the pressure on myself/focus on myself of how I “should” be. No, I need to JUST BE in the Lord and with others and focus more on Him/on them and less on how I should be presenting myself. Thanks for a truly challenging piece this morning, Megan, and a perfect articulation of my heart’s response, Mel. Wow.. so powerful and so relevant. Thanks for this Megan!